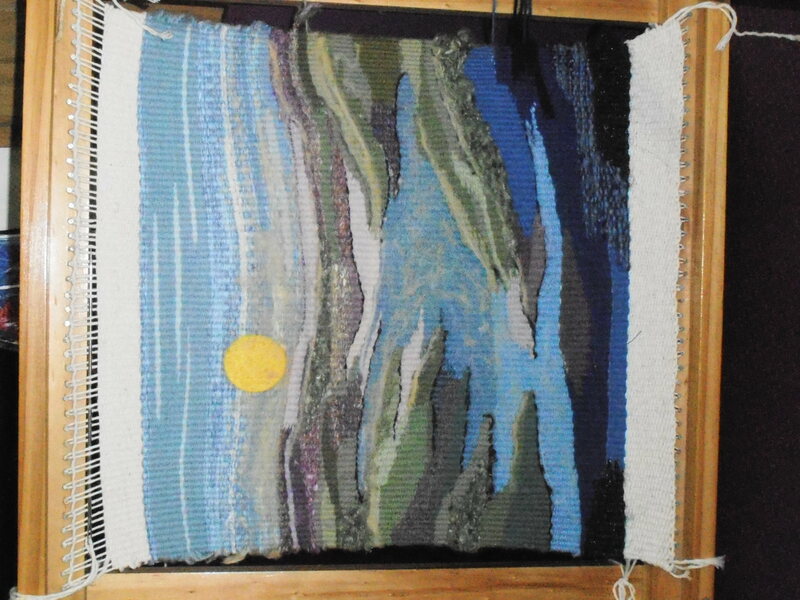 Olive’s Tapestry Weaving Landscape is finished. Still on the frame and she hasn’t decided what she’s going to do with it yet. 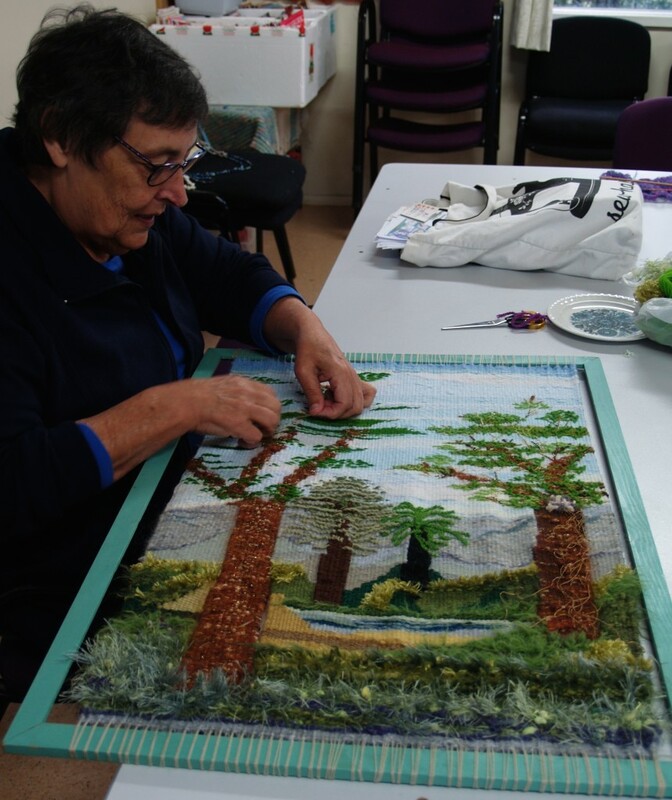 Olive has been working on this beautiful landscape for a while now, and it’s almost finished. We can’t wait to see it when it’s all done. 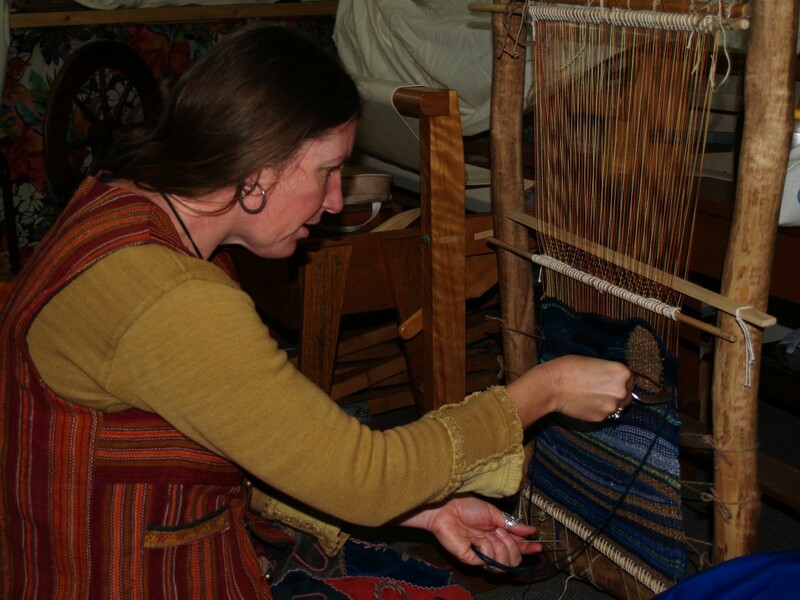 Rachel is weaving on her Navajo Loom which she made herself. 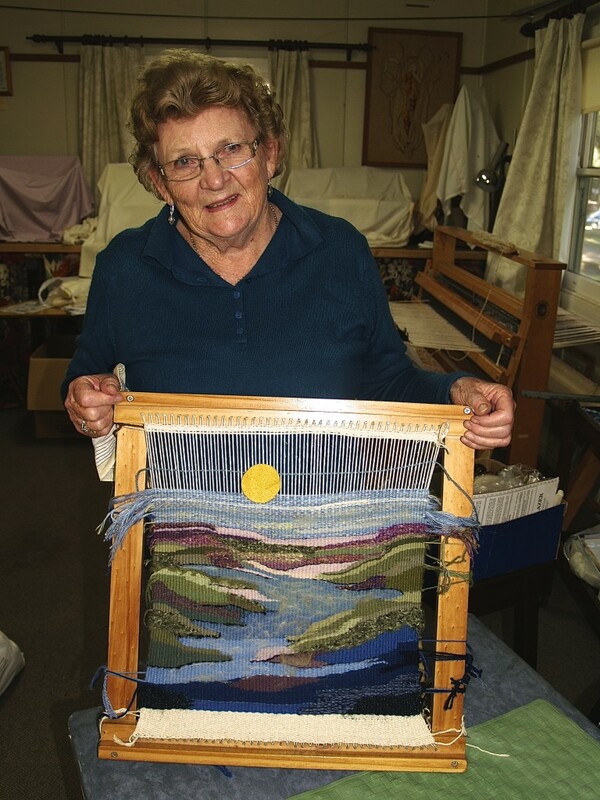 She taught herself how to put it all together and is now weaving a water themed piece which looks fantastic. I had a photo in this frame but the glass in front was broken so I thought – I’ll use this as another frame for a weaving – had trees in mind and thought I’d use up my stash of various wools. So the foreground is all types of yarn and I’d change it every now and then just to alter the texture and started putting in the trees, and hills and distant mountains. I didn’t have a pattern, only what was in my mind and the water in the middle just came about. I’m in the end stages of finishing this and will wrap the frame with material of some kind when it’s finished. 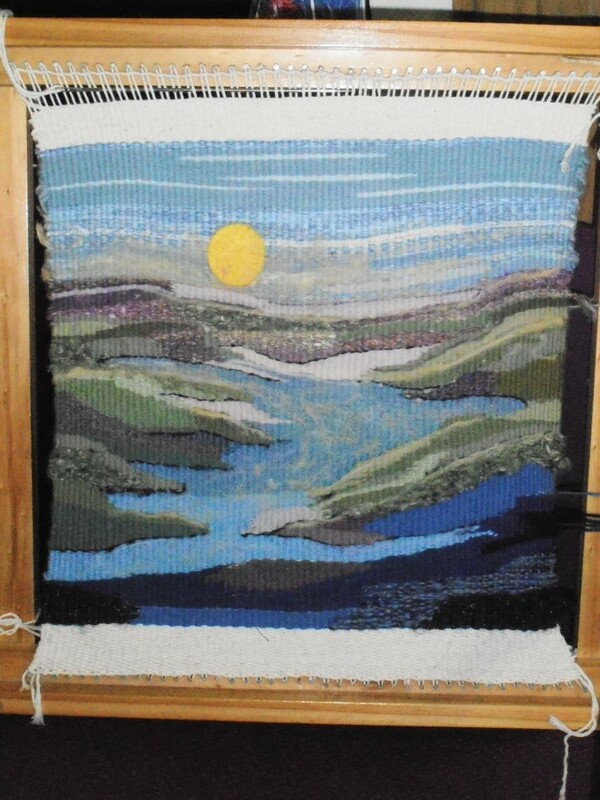 And again, the encouragement of members, including a gift of green wools from Megan T has enthused me to do more – but maybe with not so big a frame in future, it has taken a while. And guess what !!!! I still have a large stash of wools. Do these stashes never end? By Eileen. Intending to cull my “stash” of patterns, craft ideas and inspirational pictures I looked through them and found some pictures of “weaving” from the McCalls magazines I used to hoard from the 1970’s (those were the days !!) 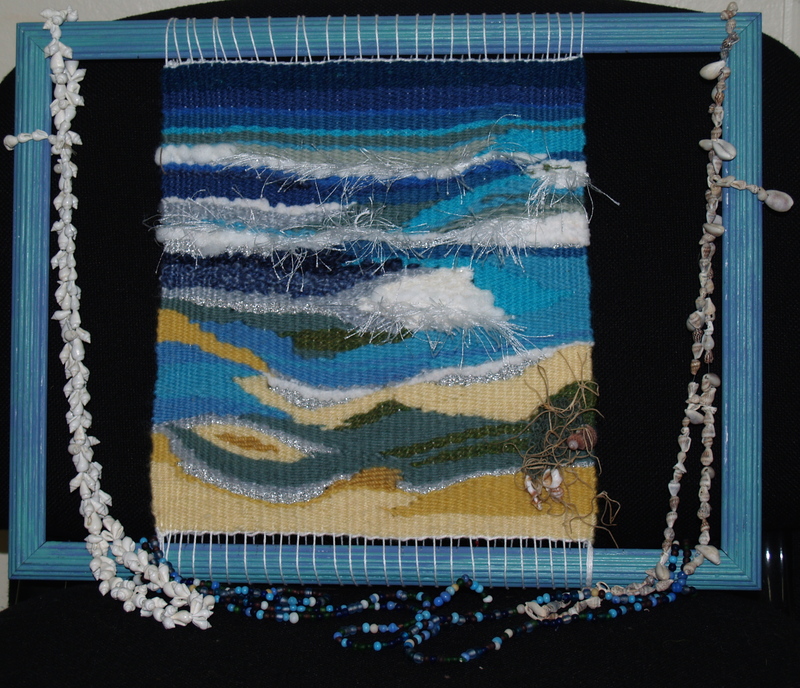 Finding a few pictures of weaving I was inspired to try my hand and with Gay’s advice started by just using a picture frame – I found various types of wool and acrylic yarn, and devised a pattern of waves coming into the shore – and it was fun. Margaret also gave me a few tips on how to “join” different slabs of colour and I was off. I then finished off with some shells that I had and Kay gave me some organic stuff (Old Man’s beard) which is woven in and around the shells. I found some necklaces that were around and draped them on the frame and hey presto – one picture. Of course I never actually culled my stash !!! By Eileen. Megan has been weaving this rug on our large loom for about two years by her reckoning. She is looking forward to finishing it. 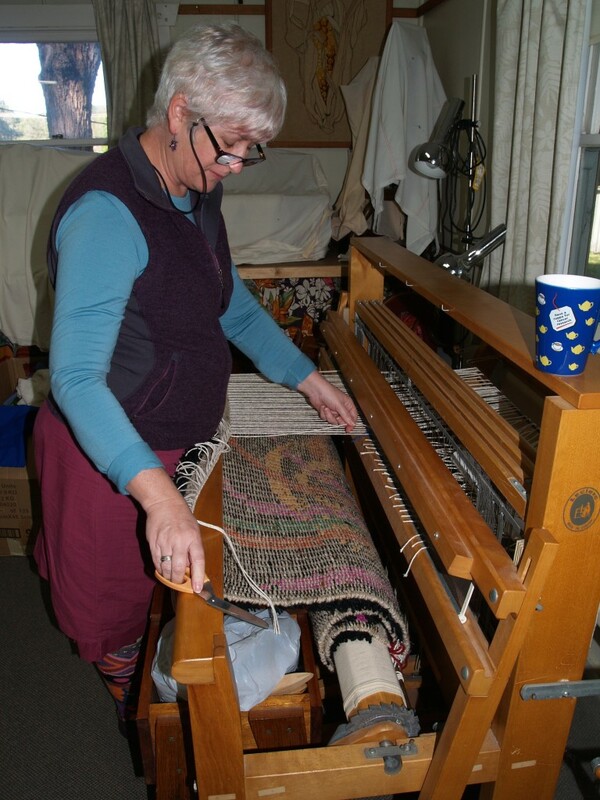 Megan has achieved a very shaggy look by knotting lengths of yarn onto the warp. This is very time consuming. Megan plans to use the rug on the floor in her home. 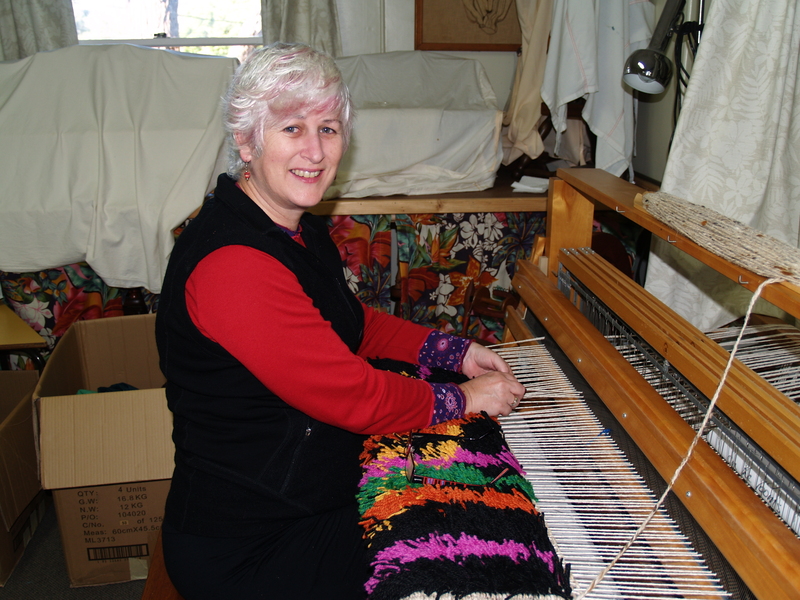 Rachel weaves every day. She says it’s like a meditation. Some relaxing music in the background to accompany the back and forth of the shuttle on it’s way to creating an article of splendour. What a wonderful way to start the day and she completes so many beautiful wraps in the process. This is one of her latest creations. Rachel’s large wool stash gives her plenty of choices for the main colours. 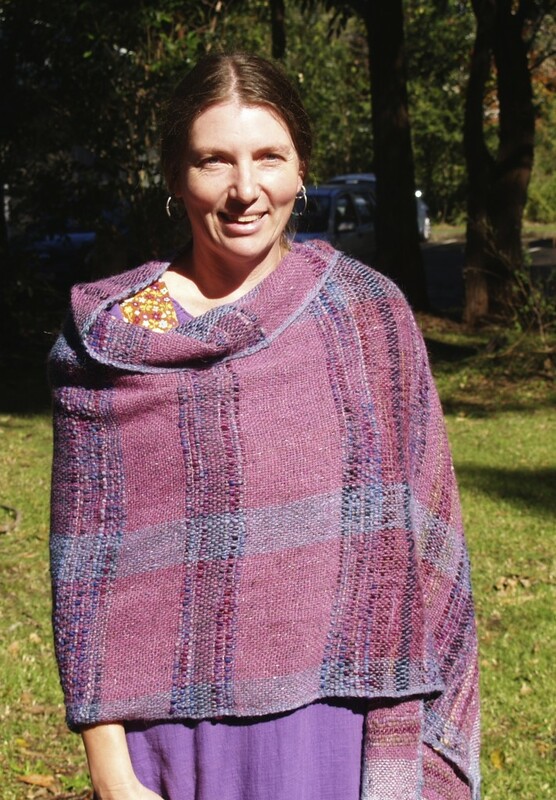 She then selects some complementary handspun art yarns to embellish her work and the result is absolutely gorgeous.